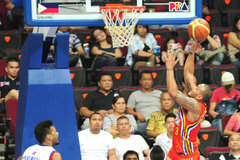 Sol Mercado will going to suit up for the Global Port together with Japeth Aguilar in this coming Conference. The Office of the PBA Commissioner has approved two trades involving the GlobalPort Batang Pier. GlobalPort’s trade of Rabeh Al-Hussaini for Talk ‘N Text’s Japeth Aguilar has been approved by the league, as well as the deal to acquire Meralco’s Sol Mercado, along with Kelly Nabong, JP Belencion and Yousif Aljamal, for Rey Guevarra, Vic Manuel, Josh Vanlandingham and a 2015 first round draft pick. “These new trades are healthy for the players and teams involved, not to mention the league, as the competitive balance among member-teams is decidedly enhanced,” said PBA commissioner Chito Salud. The acquisitions of Sol Mercado and Aguilar give the Batang Pier a solid core as the pair joins two of the league’s best offensive players in Gary David and Willie Miller.